Now 4 months later, we are starting to see the results as the first vehicles arrived and Tesla prepares to open its first permanent retail location. The company had already opened a pop-up store in the mall right after the launch, but it was also actively working on its first official store and service center. They are taking over a building previously occupied by a Porsche dealership located on Shiekh Zayed Road, which is one of the busiest roads in Dubai. It’s near the Burj Khalifa metro station. 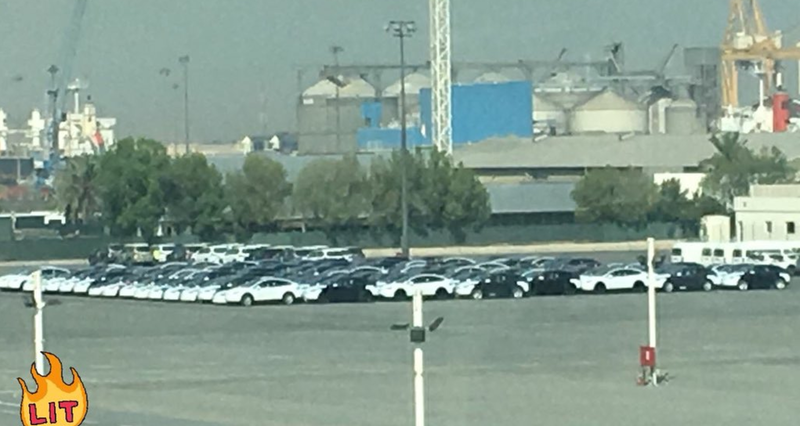 It looks like Tesla timed the invites with the arrival of the first batch of vehicles for Dubai and the United Arab Emirates. Tesla started taking orders after the launch in February and it announced that deliveries would start in July. Also, some of the vehicles could go to Dubai’s taxi fleet. During the launch, Musk signed a deal with Mattar Al Tayer, Director General and Chairman of the Board of Executive Directors of the Roads and Transport Authority (RTA), for 200 Tesla vehicles to be used as taxis in order to eventually create a new self-driving fleet once Tesla enables its ‘Fully Self-driving Capability’ feature. Only a portion of the first batch will likely go toward that deal since there are also a lot of private buyers waiting for their cars. Even before Tesla officially launched in UAE earlier this year, there were already a lot of local owners who went through the trouble of importing their cars. Last year, they held an annual meeting and made a plea to Musk and Tesla for more service in the region. It looks like they are about to get their wish and be joined by many more new Tesla owners.